We believe, that He manifest within the Transfiguration not some other manner of light, but only that which was concealed beneath His exterior of flesh. This Light was the Light of the Divine Nature, and as such it was Uncreated and Divine. 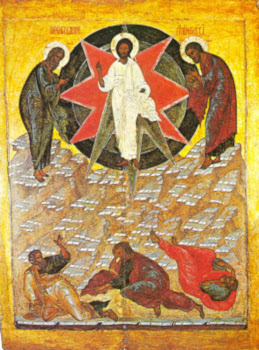 So also, in the teachings of the theologian-fathers, Jesus Christ was transfigured on the Mount, not taking upon Himself something new nor being changed into something new, nor something which formerly He did not possess. Rather, it was to show His disciples that which He already was, opening their eyes and rendering them from blindness into sight. For do ye not see, that eyes with sight in accord with natural things, would be blind as regards this Light? And thus, this Light is not a light of the senses, and those contemplating it do not simply see with sensual eyes, but rather they are changed by the power of the Divine Spirit. They were transformed and only in such manner did they see the transformation, transpiring amidst the very assumption of our perishability, with in place of this the deification through union with the Word of God. And thus also She that miraculously conceived and gave birth did recognise, that He born of Her is the Incarnated God. Thus too it was for Simeon, who but only received hold of this Infant into his arms, and the Aged Anna, coming out [from the Jerusalem Temple] for the Meeting — since it was that the Divine Power did illumine, as through a glass windowpane, giving light for all those having pure eyes of heart.